A senior Boxer dog was unwanted and alone in the shelter. She had a sweet personality and was with animal rescue workers who cared at the Carolina Boxer Rescue. Photos of the Boxer were put online along with the “available for adoption” sign that made her look like the perfect catch for the right family. 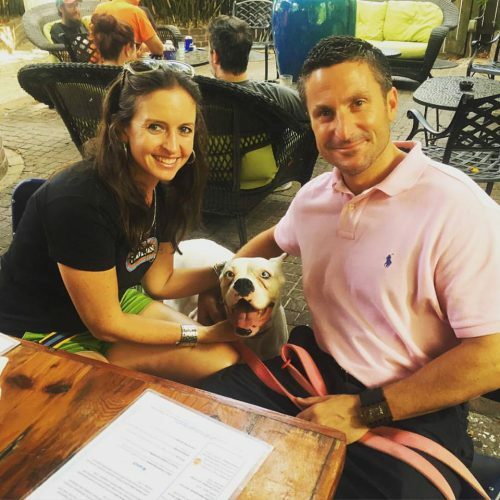 But no one was interested in adopting the lovely dog, which surprised Tom and Jane Cannone. The Carolina Boxer Rescue not only serves the Carolinas but parts of Virginia as well. It helps Boxers find homes in the area. The Cannones live in Virginia and were shocked to learn that no one had snatched up the adorable senior Boxer they had seen in the adoption photos. 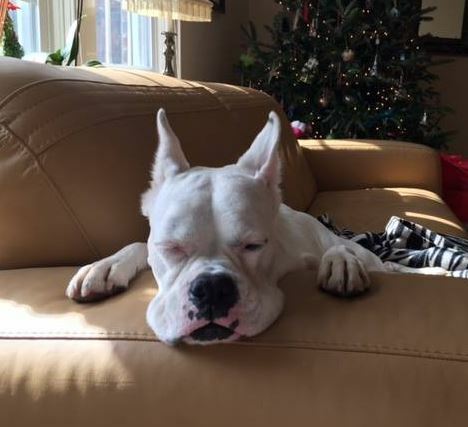 When the couple started asking questions, they realized that the reason no one wanted the dog was probably that she was deaf. This handicap would make it hard for the new owners to forge a connection and issue commands to the canine. But that did not deter the Cannones. They were drawn to the dog and decided they were meant to adopt her. Without second thoughts, they drove from their Virginia home in Norfolk to Charleston, South Carolina. They signed the paperwork and took the senior Boxer home with them to join their family. Thankfully, the boxer, whose name was Boombox, had probably had kind owners in the past, because she was well-behaved and not afraid of affection. It did not take Boombox long to adapt to her new home and fall in love with the Cannones. She really just wanted a peaceful place to spend the rest of her life. During a routine trip to the vet, Boombox’s family learned something about the dog. Because the vet Layne Brett knew that the senior Boxer was deaf, he decided to conduct an experiment. The vet gave a hand motion that means “sit” in dog sign language. And that’s when the Cannones and their vet learned that Boombox was fluent in doggie sign. Dog trainers have adopted a system of signs that are used with show dogs, police dogs, and others. Boombox knew a lot of these signs and could perform the commands on demand, Jane Cannones told The Virginian-Pilot. What a talented dog! It was a surprise for the Cannones to learn that someone had trained Boombox to understand doggie sign language. But it was a huge benefit as well. Now they had a way to communicate with the dog so she could interact with the world around her. As a result of the way she was trained, Boombox keeps her eyes focused on her owners all the time. She is ready to complete any command they give. But she is most excited to see that sign for “walk” as those are her favorites. What do you think about Boombox’s surprise set of skills?